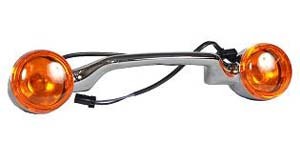 Clean-up your Electra Glide when running "Bagless"! Several products when running "Bagless"
4000 Series Kits: This kit cleans up the backend of your FLH/FLT when the saddlebags are removed. The patent pending two piece saddlebag/exhaust support bracket uses a quick release to allow the bags to be removed or installed in minutes. 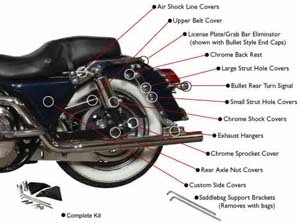 Included in the kit are our custom side covers, chrome shock covers, quick release saddlebag support bracket, and chrome exhaust mounts. These kits fit '97-'08 FLH/FLT models. Installation is simple with common hand tools. NOTE: Road King Custom models require the optional guardless supports. We recommend these for all models. 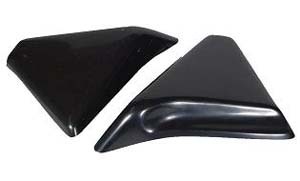 BP-4001: These custom side covers give your bike a nice clean look with or without the saddlebags installed. They follow the lines of the frame and do not cover up the tire like the originals do. The covers are made from fiberglass and feature stud mounting just like the originals for easy installation. They fit '97-'08 FLH/FLT models. These will also work with a power commander installed. Sold as a set. 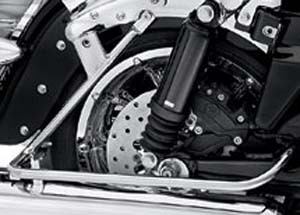 BP-4002: Chrome shock covers slip over the upper half of the shock where it is painted black. The covers feature a split design that makes installation easy. They dress up the backend with or without the bags installed and look great along with our air line covers. For '97-'08 FLH/FLT models. Sold in pairs. HD-565: Eliminate the rear saddlebag guard for a sleek, custom appearance. This custom kit replaces the loop saddlebag guard with a bolt-on chrome-plated support leg. Kit includes all necessary mounting hardware. Fits '97-'08 Touring (except FLHRC) models. Stock on FLHRS, FLHX and '04-'08 FLTR models. Special ordered part. HD-881: Eliminate the rear saddlebag guard for a sleek, custom appearance. This custom kit replaces the loop saddlebag guard with a bolt-on chrome-plated support leg. Kit includes all necessary mounting hardware. Fits '09-later Touring models (except FLHRC, FLHTCUSE4/5/6/7 and Trike). Stock on '09-later FLHX, FLHXSE/2, FLTR, FLTRU, FLTRX and FLTRSE3 models. Does not fit with Saddlebag Filler Strip Kits. Special ordered part. BP-4006: Exhaust mount brackets. They fit '97-'13 FLH/FLT models. Sold in pairs. BP-4007: Stainless steel braided air line covers hide the unsightly air lines on all FLH/FLT air shocks. The braided line features a clear protective cover to prevent abrasion on your frame and chrome. These covers install in minutes with no tools required. They fit '97-up FLH/FLT models. Sold in pairs. BP-4009: Chrome shock bolt covers hide the mounting bolts of the shocks. Order a set of two for the upper bolts only, or, a set of four to do the upper and lower bolts. Fits '97-up. 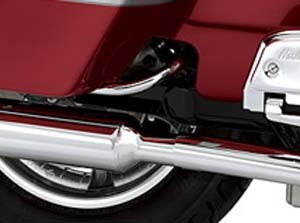 BP-4010: Chrome plated plastic fastener covers the small holes in the rear fender struts. To cover all of the holes you will need three pair of small and one pair of large covers. Sold in pairs. Fits '97-'08. BP-4011: Chrome plated plastic fastener covers the large holes in the fender struts. To cover all holes you'll need one pair of large covers and three pair of small covers. Sold in pairs. Fits '97-'08. Note: Most bike need 3 small 4010 struts and 1 set of 4011 large Strut. 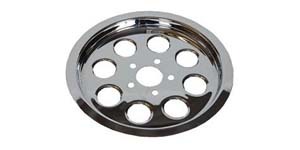 BP-4017: Chrome plated metal covers are custom machined to fit '97-'01 rear axles. Sold as a set. BP-4019: Chrome brackets dimensionally identical to the Harley Davidson brackets. NOTE: These do not have the holes for the air shock filler valves. You may have to relocate your filler valves. These fit '97-'08 models. Sold in pairs. BP-4020: These brackets allow you to eliminate the rear fender struts, while allowing you to install your saddlebags and brackets. These brackets have integrated backrest brackets. They can be used along with Carlini's bumper eliminator. These fit '97-'08 models. Sold in pairs. 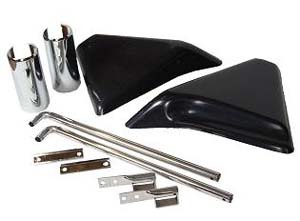 BP-4022: Use these saddlebag supports along with our exhaust hangers. 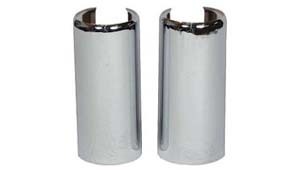 These eliminate the need for the saddlebag guards to give you the Road King Custom look. Made from polished stainless steel. Sold in pairs. For '97-'08. BP-5101: Fits 1999 & up models. BP-5102: Die cast chrome pyramid end caps with solid block type adjusters. Fit '97-'02 w/o cam style adjuster. 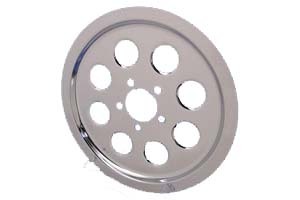 BP-5109: One piece pulley cover to match to stock hole pattern for the look of a completely chrome pulley. More work to install than our two-piece cover but the results are better. 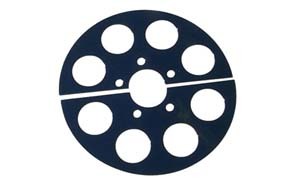 For '97-'03 bikes with a 1 1/2" belt. BP-5111: Chrome one-piece pulley cover for '04-'06 bikes with the 1 1/8" belt. This will also cover up the small holes in the pulley. NOTE: You may need to have the ridges around the large holes machined off so the cover will sit flat against the pulley. Most machine shops will do this for a minimal fee, around $25 - $30. BP-5112: Same as above for MY '07-'08. BP-5201: Chrome plated plastic bolt covers for the rear pulley bolts. These cover the bolt head and the washer. GB-EL: Eliminates rear license plate bar on FLH models. 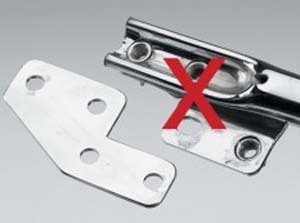 Preserve the stock saddlebag support brackets when removing the license plate support tube. Made of 10-gauge steel and chrome polished. Sold as a pair. All BP products are special sale items.